One of the more popular maidenhair fern varieties Adiantum raddianum ‘Fritz Lüthi’ comes in two forms, one with a blue hue to the foliage. This is a fern that will grow well indoors, or perhaps in a conservatory as it does appreciate good humidity. Growing naturally in damp areas, it can be grown outdoors in a protected position, shade and moisture are required. The fronds are triangular in shape, the foliage a mid green and the stems an attractive contrasting black. Indoors use a potting mix that is rich with organic material. Try a saucer of water with pebbles in it to sit the pot on to increase humidity. Fertilise from spring through summer with a liquid seaweed fertiliser. A position in good filtered light is best, and keep the plant away from heating and air-conditioning outlets. Repot every 2- 3 years as the growing medium begins to break down. The best time to repot is in spring. 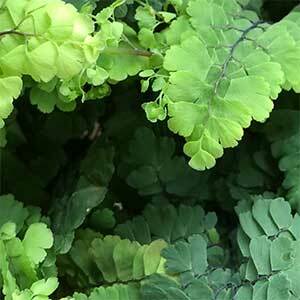 Common Name – Delta Maidenhair Fern. Height – To around 40cms. Spread To around Clumping to around .5 metres. Foliage – Mid to Deep Green/Blue.